3. IMPEMENTATION OF REVISED TRANSFER POLICY 2014, with immediate effect. The employees should not be complacent , irrespective of internal differences, copy down the proforma mutatis mutandis, if needed translate into Hindi or Regional languages of the states to convince the Member of Parliament of the matter. The proforma of MPs letter is given as well for the letter to be written by M.P on the letter head .Kindly hand over the same immediately in English language for onward transmission by his office to the HRD Minister and Finance Minister. 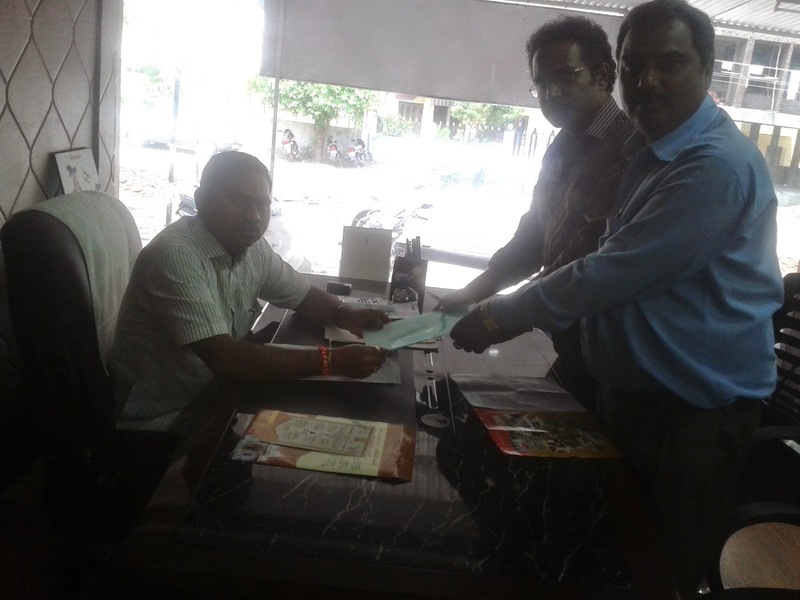 Photographs be taken of handing over the representation to M.Ps ,or a received copy, be sent to the Dy .Gen.Secy AINVSA by email sajith_nair12@rediffmail.com as a compliance report of the same. I have come to understand that the Staff Association of Jawahar Navodaya Vidyalayas have been striving to get Recognition since 2006. The submission of Membership forms and documents are called upon, but no timely actions and procedure conducted. It calls for an explanation and is not wholly justified. There should be a proper redressal mechanisms in all Govt bodies, inter alia, NVS to make the institution run smoothly, with proper avenues for satisfying the demands and needs of the employees. Joint Consultative Machinery be formed as per the Recognition of Service Association (RSA) rules and GOI provisions, to stop the employees from resorting to other modes as protests, dharnas, strikes etc. The administrative body and the officials should not linger, unnecessarily, the Recognition procedure. The NVS Headquarter should not give time to the employees to express their vent up feelings, but, on the contrary expedite the Recognition Procedure. Disputes between different Associations and groups should be chalked out amicably by the intervention of the Headquarter officials with the Cental Executive Body members of this factions and groups and calling upon them for a joint/collective meeting in order to merge them by official mediations, instead of finding pretext not to give Recognition .Table talks and negotiations be conducted between the disputed groups by proper intervention, supervisions ,mediations and discretions by NVS . 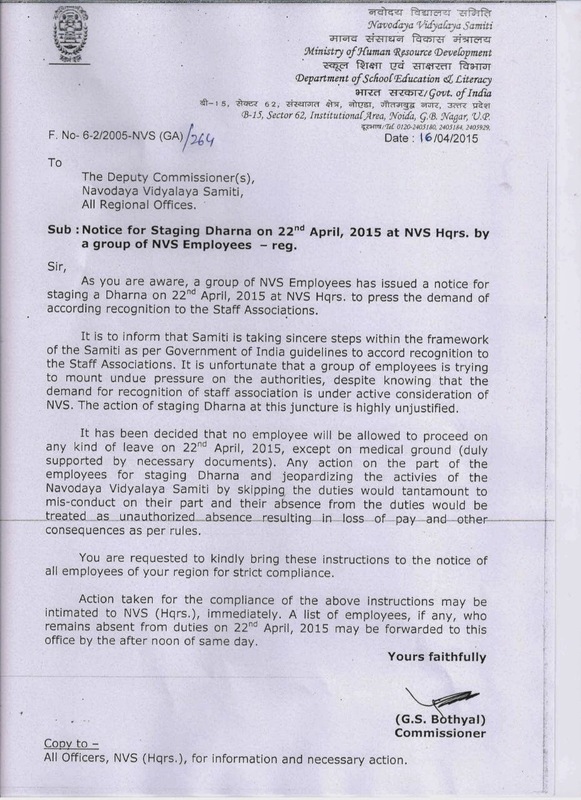 I am to suggest that the NVS Headquarters be directed to expedite granting Recognition procedure to Staff Associations; it would only be expedient to do so, to stop the unrest and dissatisfaction among the staff, to stop any coherent actions by them in near future. Navodaya Vidyalayas run under the HRD Ministry as an autonomous body ,running CBSE Schools from 6th standard to 10/12 standard.,after the Selection test in every district for the entrance in 6th standard. 6. Staff Associations not given Recognition, unnecessarily delayed by promoting factions of the same association: asking for different membership under the same Registration number/same banner or name. We have constraints to inform you that members of staff associations when approach the higher authority or seek reddressal of the afore said staff grievances OR asking Recognition of their Staff Associations are punished with Suspension, administrative transfers etc. Even the Gandhian mode of non cooperation, dharna etc to voice our grievance are nipped in the bud, by viewing it very seriously and an oral directions telephonically to all Regional office to penalise them. The deterrent measures of suspension and administrative/ public interest transfers only for seeking redressal of grievances is against the principles of natural justice. We humbly request your good office to forward the rough draft enclosed herewith in your letter-head to the HRD Ministry for the implementation of much awaited REVISED TRANSFER POLICY 2014 , with immediate effect to be implemented in the year 2015.